I’ll be sharing updates on the projects that have been going on while we were offline for the next several weeks. So let’s jump right in with an update in the green house! 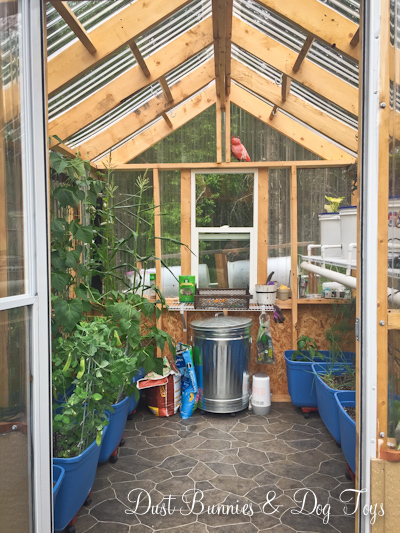 Temps were staying above freezing by mid-May so I went ahead and planted everything I could but kept it all in the green house as a safeguard against overnight frost. 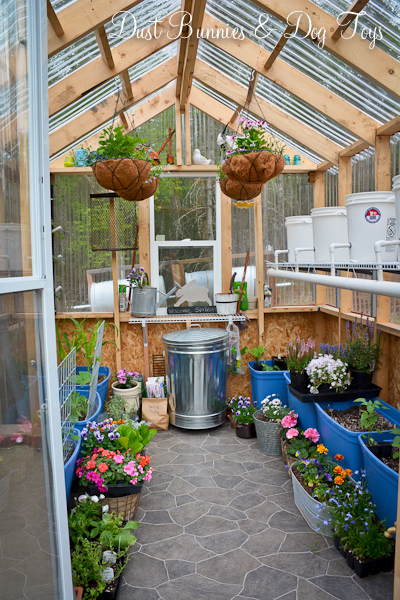 During that time I tested out a DIY hack for heating the green house I got from a local gardening club – a crock pot of water! It not only provided a bit of heat inside the structure it helped increase the humidity for the plants once I got things started. It worked really well so I plan to do the same thing again next year, although we also picked up a small heater for next season at a garage sale recently. 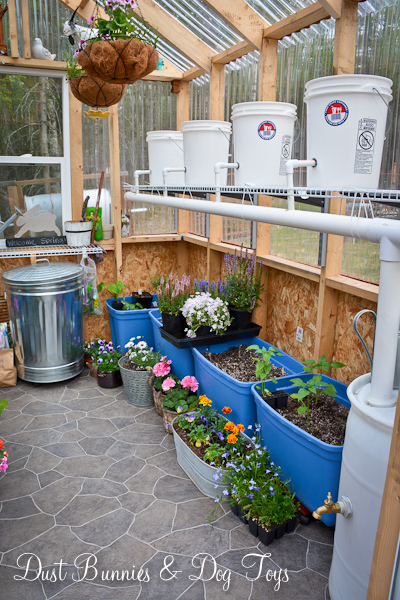 I also ran a humidifier in the green house for several weeks to help the plants get off to a strong start. That’s another little DIY I plan to do again next season. Here’s how things looked at the end of May. 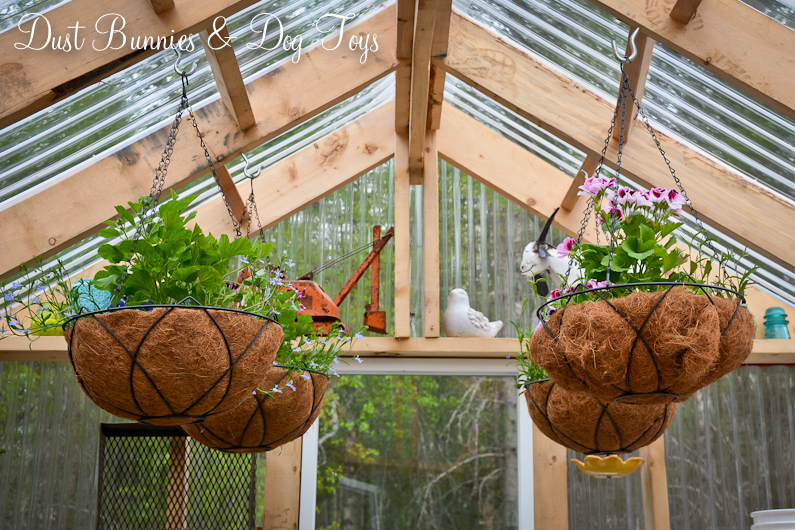 My much planned layout was working well – getting the food crops started and providing a bit of room for my flower pots to wait out the slow to arrive summer weather, including hanging baskets I put together myself with geraniums and lobelia. I snagged the baskets at Lowes for just $5 each and they came with the coconut liner, so even with the cost of the plants and dirt they were a far better deal than the crazy expensive ones the stores and nurseries put together – most of which have color or flower combos I’m not keen on anyway. 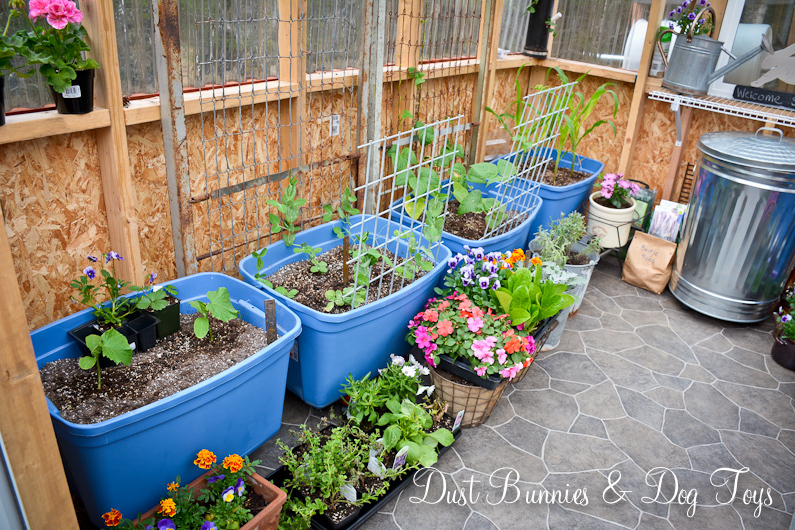 The freebie metal bed frames I scored last season fit perfectly behind the tubs to serve as a trellis for the peas and green beans. 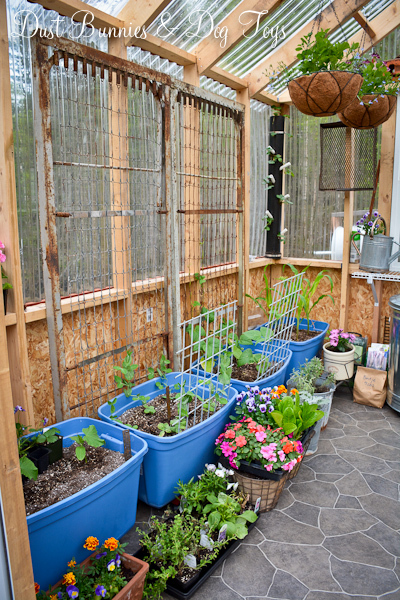 Since I could only get a couple of the plants along the back side of the tub I put a couple along the front as well and the Hubs cut me a couple extra pieces of heavy gauge fencing from some scrap we had sitting around to create a mini trellis for the other side. 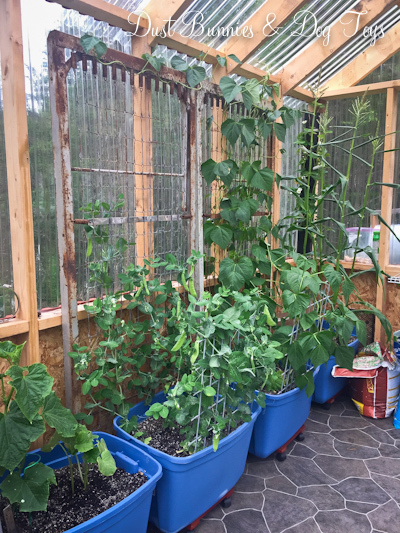 I didn’t realize just how much I had packed into this space until I started moving the flowers out to the deck and yard and suddenly had a lot more room – that is until the food crops really got going! 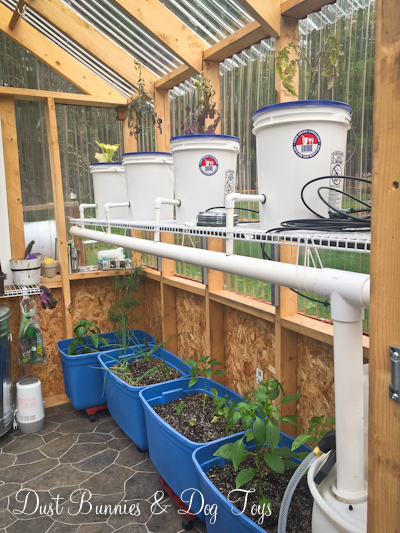 The Hubs installed a water barrel in the corner for easy watering and started putting together a hydroponic system for the tomatoes but got sidelined with our trip, so we’re just now finishing that project up. I’ll share the details of that set-up soon. Although not everything made it through the transplant and adjustment period, a good majority did and things are growing well now. Here’s how things are looking now! Not bad for our first season with the green house and learning the ropes. We’ve already enjoyed peas and lettuce from our efforts several times and look forward to plenty more before the summer is over. Tomorrow I’ll share a closeup look at the vertical space-saving strawberry planters we’re using and the DIY solution we came up with to water them, so be sure to check back.